After a morning exploring Liverpool’s Roman Catholic Cathedral we spent an intriguing afternoon at the Hardman House. 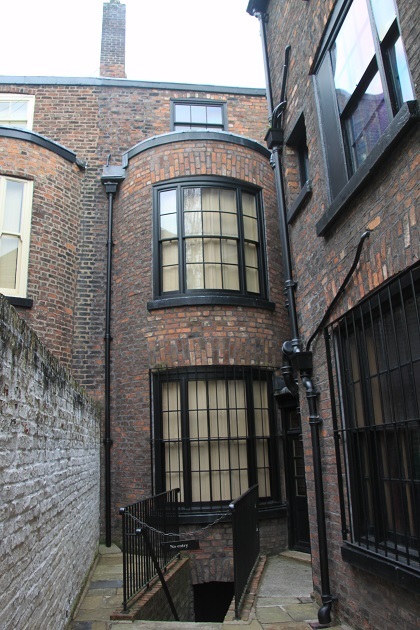 This is a National Trust property just a short stroll away at 59 Rodney Street. They recommend you book in advance, we did this just the previous afternoon, only a limited number of people at any one time can be accommodated in the house and so entrance is by timed guided tour. A gloomy Saturday seemed to be the right time to visit, we were able to take our pick as far as time was concerned. I read when booking the visit would take 1.5 hours, hard to believe looking at the house but it absolutely did. What’s more, every second inside was fascinating – we all agreed on that, Son was as captivated by this place as we were. 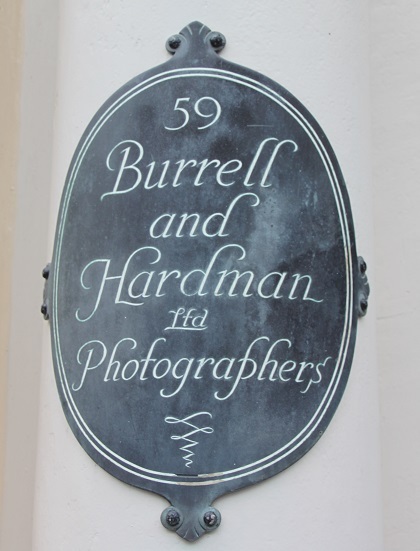 This was the home and business premises of a renowned photographer E Chambre Hardman and his wife Margaret. They lived and worked together for 40 years, were esteemed photographers and also (and most interesting for me) hoarders. This house is packed to the rafters with prints, books, postcards, toiletries, food (some dating back to the war years) and so much more. They kept everything and changed nothing. It is is like stepping back in time. 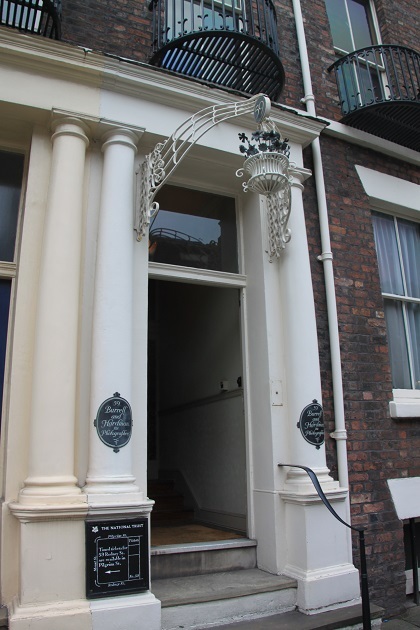 Rodney Street is impressive too – apparently known as the Harley Street of Liverpool due to the number of medical consulting rooms, the grand terraced houses are beautiful with wrought iron balconies. 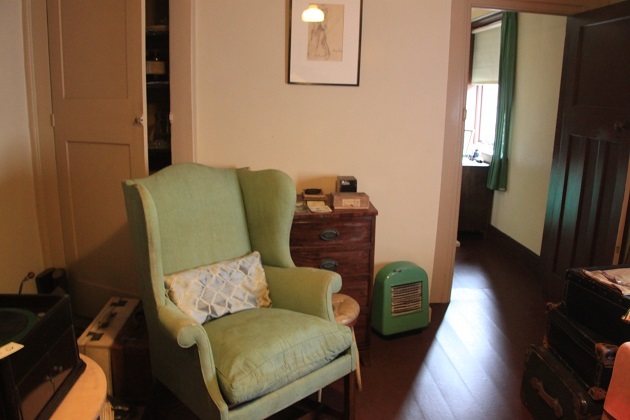 This house was also once a consulting room and there are a few washbasins in various rooms from those times. We were shown around the house by four different and very well informed guides. The tour began on the ground floor in the room Hardman once used as a changing room. We watched a video about the photographer and his work and were then led into the front room – the office where they discussed portraits with customers. 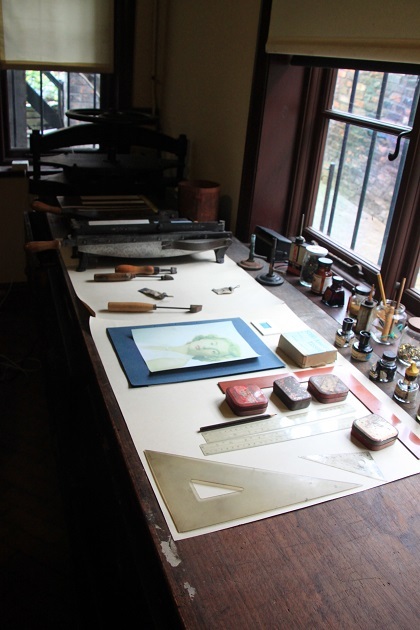 The first floor has the photographic studio – all full of lights, cameras and framed photographs. 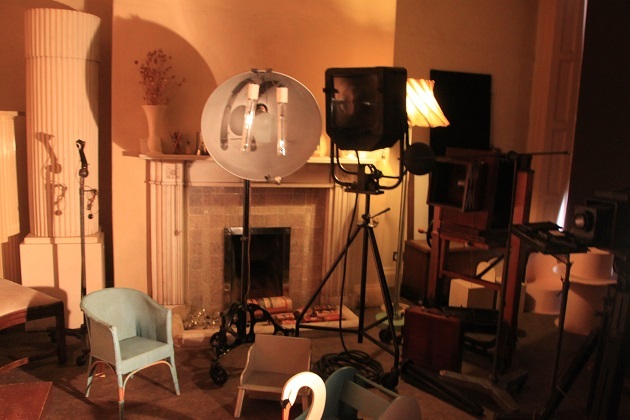 There are toys spread around which they used to entertain children and so many cameras, lights and bits of kit. 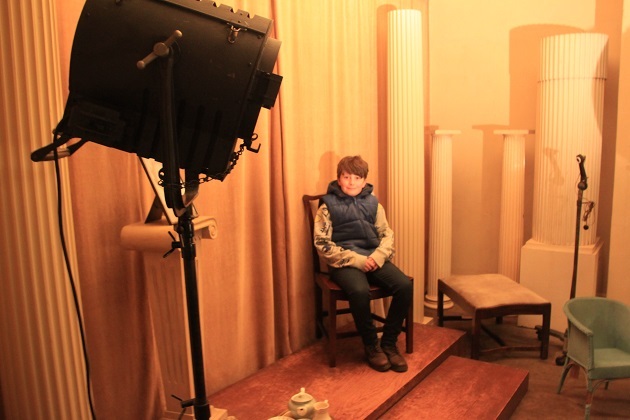 Son got to strike a pose in the chair and an excellent guide explained the workings of some of the old cameras – sounds dry but it was compelling. We also got to see the dark room. 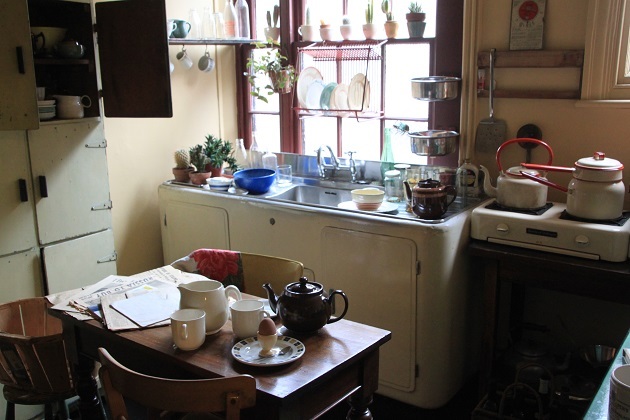 We browsed a little while in the exhibition about Hardman and his time as a soldier in India but then came the piece de resistance – the couple’s living quarters. The house is grand, beautiful and so impressive – except for the part where they actually lived. 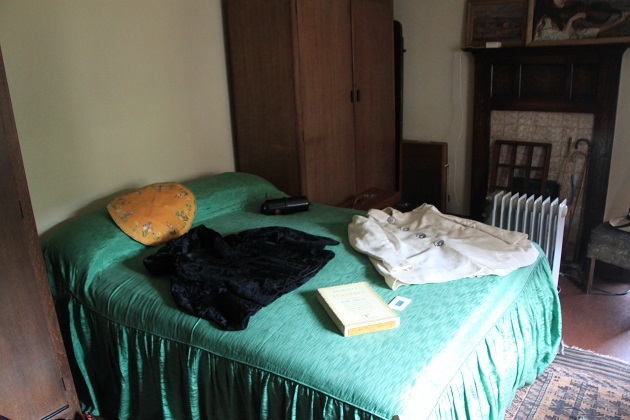 Just three cramped rooms, the Hardmans obviously did not believe in luxurious living. It is fascinating, even here they threw nothing away. In a bedroom drawer were hundreds of bars of soap – collected from hotel stays. 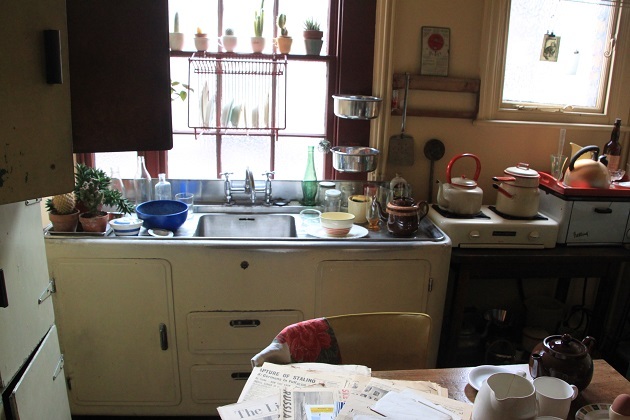 The living room had piles of newspapers, magazines and in the tiny kitchen we saw one cupboard full of old food and Mrs Hardman’s false teeth. 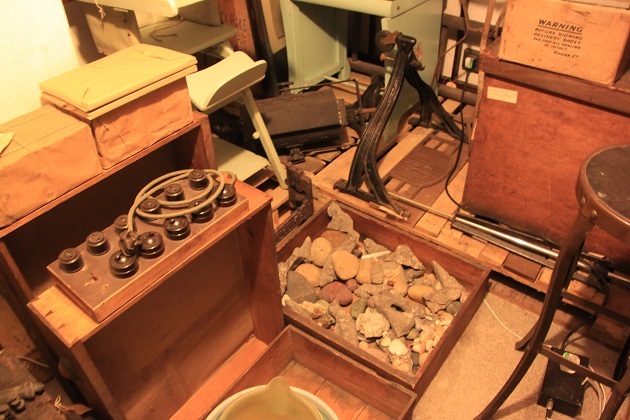 The cellars were stuffed too – a massive pebble collection, an old bath and the staff dark room amongst other things. We saw one last room where the portraits were finished and framed and then walked through the garden past an Anderson shelter on the way out. An entirely fascinating and wonderful place, definitely an afternoon well spent. Afterwards another short walk to Liverpool’s China Town where we ended the day feasting on a delicious Chinese banquet. Looks like a really interesting and different day out! Nice to see a historic house with a bit of a twist. The living quarters were just fascinating – we hadn’t done any research about the place so didn’t know what to expect but like you say, it had a real twist and was a great place to visit. What an interesting place to visit. Hoarding is something very strange isn’t it… A pebble collection???! LOL! I know – it seems like there was nothing they didn’t keep and collect!! Every time they stayed in a hotel they took the soap home and kept it in a drawer!! Makes for an interesting afternoon though to see all that “stuff” but don’t think I could live like that!! What an absolute treasure trove. I love the detail of the bars of soap. It’s completely fascinating and just the amount of stuff and what they kept is mind blowing. Apparently every time they went to a hotel they took the soap home – a huge drawer packed full to the top with it and they never used any of the hoard – and that was just the start!! Thanks Kamila – hope your day is a great one too. Went to see this a couple of years ago and, like you, thoroughly enjoyed it. Hard to believe that he was living and working there when I was at the University just up the hill. It’s an incredible place, it was on my radar but took us ages to get around to visiting. We all found it fascinating – just the amount of “stuff” they had was incredible!! Have you done the Beatle’s houses? Not yet… another of those places I keep saying we need to say but just haven’t got around to it!! Is it good? We did the tour some time ago and enjoyed it. The houses are ordinary semis and done up as they would have been during the 60s, so brought back lots of childhood memories for me. A certain Mr Zimmerman booked on the tour a couple of years ago (anonymously) so you never know who you might end up sitting next to on the mini bus! This looks so interesting–almost like two entirely different places in one, wth the professional aspect and the personal. And I love that the decision was made to preserve the hoarding aspect and to show it all! That’s exactly what it was like – 2 completely different places and quite intriguing to see how humble their living quarters really were compared to all the space they used for the business. The hoarding aspect just fascinated me – other people’s junk is just so interesting! I have never heard of this but it does sound fascinating! Like others, I can’t get my head round the idea of taking all that soap with no intention of using it. Two (separate) friends had neighbours who hoarded and their stories were horrific (eg a wall of used teabags) but those were single, elderly men. It must be more unusual for a couple both to have the same mindset I think. My husband is a bit of a hoarder but we balance each other out – I throw things away when he’s not looking!! I know what you mean though, a couple both keeping absolutely everything from pebbles to all that soap. Makes for an intriguing afternoon though and it’s all so well preserved. What an interesting house preserved ‘in time’. I hadn’t heard of it so its nice that you have written about it. I just love visiting places like this and how intriguing with the humble conditions of the living space compared to the photographic business rooms. We’ve actually become National Trust members this week so that’s another good reason to visit sometime!! This is a great one to visit – we’ve been National Trust members for years now and there are so many good places but this one is just that little bit different. 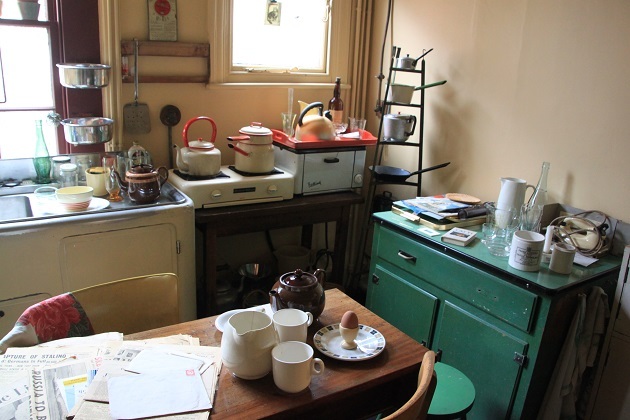 I loved peeking into their living area, it was fascinating and the kind of place you could go back to as it is so hard to take everything in. What an absolutely fascinating place, just the type of place I enjoy visiting indeed. The photography angle lends an extra layer of interest for me. I have an interest in the history of photography as my Great-Great-Grandfather was a studio photographer from the early 1870s onwards. Indeed, in 1880-81 he was working in Liverpool. You would definitely appreciate this place Laura with that family history! I loved all the old cameras and the studio – the darkroom was also fascinating but then the living quarters and the “junk” – it’s just a really special place and so well preserved. I like snooping in other people’s houses:)) interesting place! There’s plenty to see here for sure!! I know – I loved those too, would look good in any kitchen!! Joy, how fascinating is this house! Obviously, we didn’t know about this house when we visited Liverpool last summer! I can’t imagine seeing all the interesting things they hoarded. I so enjoyed reading your commentary and taking a peek inside! It’s a bit off the radar Pam so with all the other things to see I’m not surprised you didn’t visit on your Liverpool trip. We’ve been to the city many times and only just visited ourselves – they underplay what there is too, I wasn’t expecting such a treasure trove – it’s incredible! very interesting indeed…i am really fascinated by those kind of studios and photography work places you happened to narrate. It was great to see the old studio with all the pieces of kit and have them explained to us. I also found the dark room incredibly interesting. I love those museums which preserve/recreate life as it was. Trouble is, the older I get I seem to recognise it more and more. Pebbles are interesting, I have got a driftwood collection! I have never considered a pebbles collection – As well as the driftwood I have some seashells and some postcards! What do you collect? The tackiest thing in the world – fridge magnets!! My husband would also say I collect shoes but that’s a necessity not a collection!! Very rustic house. The kitchen seems messy though. It’s so tiny and has so much stuff crammed in there! It was a case of waste not, want not wasn’t it Rosemary – I remember my granny never wasted a thing and could almost turn her hand to anything. I think maybe we’ve gone a bit too far the other way these days but the clutter in this house, great to poke around and see but it would send me right round the twist!! My husband is a hoarder though but I (try) and keep on top of his bad habits!! We’ve been loving all the sunshine, perfect to come back to although my son would say not so great for school!! Hope you have a lovely weekend too. Do love an NT property and Hardman looks so interesting. I can see why you have to book in advance. Chinese food after sounds pretty amazing – I love chinese – obviously! It was just a really unusual place, we’re big fans of the NT places too but this was just a little more quirky and different than usual. What better than a Chinese banquet to end the day!! What an interesting place, Joy…even a bit quirky. I especially love that last photo. 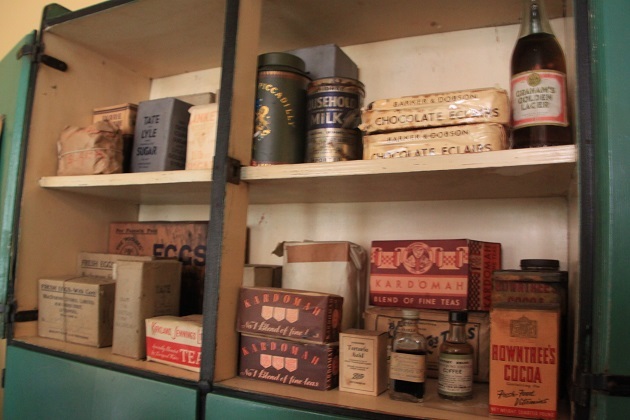 Other people’s junk from years ago can be so interesting George – we just loved this treasure trove, I was amazed to see what was behind those walls! !